Designed cell phone hard case for those with an on-the-go lifestyle, our ACTIVE™ case provides great shock and impact absorption. With two layers, our ACTIVE™ case is slightly thicker than our SURFACE™ case. The ACTIVE™ Skin, the first layer, is a highly durable polymer that covers vital ports and controls. The second layer, which is the ACTIVE Skeleton, fits over the ACTIVE™ Skin and provides extra protection at impact points such as corners and sides. 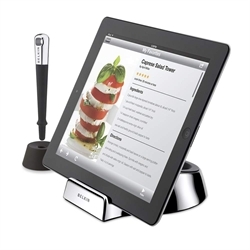 Made especially for use in the kitchen, the Chef Stand + Stylus gives you the freedom to interact with your tablet while you cook—without worrying about touching your device with messy hands. The case-compatible stand has a non-slip rubber base and two different angles that are ideal for countertop use. The wand allows you to follow recipes and browse the Internet without ever laying a finger on your screen. It comes with its own storage stand and is easy to grab while you’re busy handling food and other kitchen equipment. The magnetic tip works with any touchscreen, and can be used to wake up an iPad 2. All components can be washed by hand using warm, soapy water. The Solio Bolt solar solar phone charger is your perfect companion, keeping you online and in-touch on the go. With an on-board battery and rotating solar panels, the Solio Bolt charges popular USB powered gadgets from your smartphone and MP3 player, to your e-reader, GPS, and camera. Simply connect to the Bolt using your device’s own USB charging cable. Holds charge for up to a year. The Bolt with give most smartphones two + complete charges! Charge the Bolt from the Sun, USB port, or the wall. The Colonel designs his quality cell phone holsters with YOU in mind, the way you want to use them. The No. 46 Holster is for those of us who prefer our phones in a vertical carry. This holster accommodates taller phones, MP3 players and other devices, with a 2-position closure on the over-the-top flap. Hand-set rivets and ball stud closure are in polished nickel silver. A vertical belt loop on the back accommodates up to 1 1/2" belts. Like all of the Colonel's products, the No. 46 Holster is handmade in the Col. Littleton Workshop located in Lynnville, Tennessee, using soft, dry-milled American Steer Hide, edge-stitched for extra reinforcement. The Executive Premium KICKSTAND® features a convenient slide installation that utilizes multiple sturdy clips for secure storage. With points of contact, your BlackBerry® PlayBook™ will slide in to install without a struggle. Executive Premium KICKSTAND® allows complete accessibility to all ports and buttons. Charge your device with ease through the open charge port while your device remains secure in this case. The slightly elevated typing position allows you to conveniently and comfortably type or edit documents or surf the web. With the Premium KICKSTAND®, awkward typing angles are a thing of the past! The stylish, head-turning Abruzzi® case is designed for the fashionable, sophisticated mobile phone user. The premium leather cell phone case is accented with a contrasting stitch that adds flair to this classy case, while its executive interior lining protects its contents. Its slim, yet durable, belt clip allows the case to sit comfortably and securely at the waist or on a belt, bag or briefcase. Let your REDFLY ride in style. This bluetooth car kit provides everything needed to mount a REDFLY Mobile Companion and phone in your car. This Kit from RAM Mounting Systems provides all 5 parts needed to mount a REDFLY Mobile Companion device and any phone in a vehicle without the need to drill holes in your vehicle. Using the front bench or passenger side seat rail bolts as attachment points, existing hardware in the vehicle is all that is required to secure the base. Because of their unique ability to absorb damaging shock and vibration, RAM Mounting desks are the perfect choice for securing computers and electronics of any type. Adjustable grips easily slide to accommodate any smartphone or PDA. RAM components in this kit include Universal Laptop Mount Tough Tray II; 2.5" Dia. Base With 1" Ball; Ram Pod I With 1" Single Socket Arm; Ram-B-102 Everything Mount; and Lrg. Black Mobile Phone Holder. Compatible with REDFLY Mobile Companion models C8, C8N, and C7. Capture more photos, record more Full HD† videos, and play more music on your mobile phone with reliable Sandisk memory card. By adding more memory to your mobile phone, you can transport and store more photos, Full HD† videos and music - so you can get the most out of your mobile phone. Do more with SanDisk® mobile memory cards. If you're using a smartphone, particularly with a gps application, Slim-Grip™ is the stylish, affordable, highly functional, quality cell phone holder that you've been waiting for. It features laterally adjustable support legs and a strong spring-loaded mechanism which securely grips your phone. The Smartphone Experts Pocket Pouch is the thinnest, lightest and slimmest pouch leather cell phone case available for the HTC Inspire 4G, Thunderbolt, HD7, Desire HD, Evo 4G, or HD2. This well tailored case is top loading so your phone is easily accessible. As a further convenience, this case includes a ribbon pull that lets you extract your HTC Inspire 4G, Thunderbolt, HD7, Desire HD, Evo 4G, or HD2 easily from the case so it’s right there when you need it. The interior of the case is lined with a silky, velvet material that will help keep your HTC Inspire 4G, Thunderbolt, HD7, Desire HD, Evo 4G, or HD2 protected from scratches and dings. This case is smartly designed, elegant and will give your HTC Inspire 4G, Thunderbolt, HD7, Desire HD, Evo 4G, or HD2 the protection you're looking for. Leave your wallet at home with this convenient and ingenious iPhone 4 cases! The CandyShell Card is a protective, one-piece iPhone case that lets you stash up to three credit-card-sized cards inside its built-in rubberized slot. Just slide your cards in to store them securely, and use the handy thumb release to access your cards when you need them!